The leader of the Indigenous People of Biafra (IPOB), Mr Nnamdi Kanu, has protested his trial before Justice Mohammed Ahmed of the Federal High Court, Abuja. 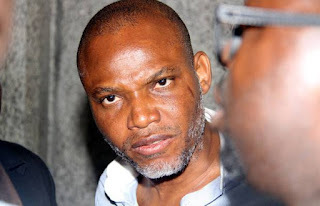 Kanu, who is the founder of Radio Biafra, refused to take plea on a six count charge of treason, importation of illegal good and possession of fire arms filed against him by the Department of State Services on the ground that will not get fair trial. Kanu, who was docked with two others says he lacks confidence in the court because information available to him indicated that he will not get a fair trial before the judge. According go to him, he will not sacrifice the due process of the law founded in the principles of natural justice upon the altar of speedy release from detention. “I will rather remain in detention than subject myself to a trial that I know amounts to perversion of justice”, he said. Reacting to Mr Kanu’s protest, the Director of Public Prosecution, Mr Mohammed Diri, asked the court to discountenance the objection on the ground that the accused person ought to come before the court with a proper application. He also adds that such a protest can only be made after an accused person takes his plea. But his counsel, Mr Vincent Obetta, stood behind his client and asked the court to oblige his client’s request. In a short ruling Justice Ahmed Mohammed said he agreed with the accused person’s protest, especially as it bothers on the issue of confidence in a judicial process. Justice Ahmed said that since the confidence of the court has been questioned, he will return the case file to the Chief Justice of the Federal High Court for further action.